Around 1858 Stevens was commissioned by Robert Holford to re-design the dining-room of Dorchester House, Park Lane, London. He also designed the mantelpiece for the saloon. 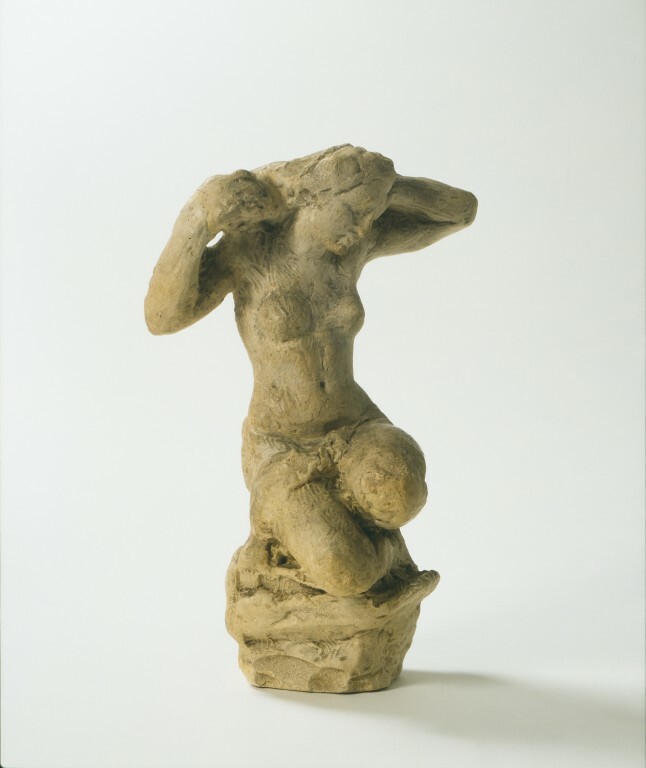 This is a plaster model for the left-hand marble caryatid figure for the dining-room mantelpiece. The original chimneypiece was finally installed in about 1869, but the caryatid figures were finished at a later date by Stevens's former pupil James Gamble. Dorchester House was demolished in 1929 and the chimneypiece was presented to the Tate Gallery, London, in 1931 by the Dorchester House Syndicate Ltd. It was transferred to the V&A in 1976 and is displayed in the Gamble Room at the Museum (inv. no. A.2-1976). A sculptor, designer and painter, Alfred Stevens (1817/18-1875) rejected contemporary distinctions between fine art and design. From 1850 to 1857 he was chief designer to Hoole & Co., Sheffield, where he produced award-winning designs for metalwork, majolica, terracotta ornaments and chimney-pieces. Perhaps his two greatest works were the decorations for the dining-room at Dorchester House, London (about 1856), for which he made countless drawings inspired by the Italian High Renaissance style, in particular the work of Michelangelo and the monument to the Duke of Wellington for St Paul's Cathedral, London, which was completed after his death. The two allegorical groups from this monument made a lasting impact on the New Sculpture movement. The influence of the Italian Renaissance is evident in much of Steven's work, and is perhaps best reflected in the Wellington monument. 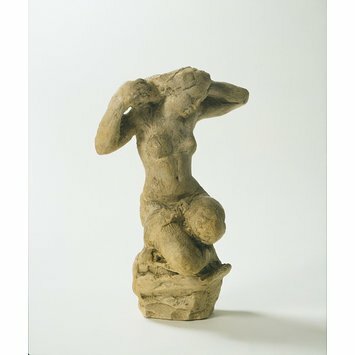 Plaster cast of a sketch model. Figure of a young woman seated on the ground, her legs tucked under her. The arms are raised and her head looking slightly down to her left is supported on her left hand. This figure and two others were deposited on loan in the museum in 1916 by Professor Schwabe in whose care they had been left by Private William Wyatt Bagshawe. On Private Bagshawe's death in 1919, as no living relatives could be traced at that time, Professor Schwabe gave them to the museum in 1934. Subsequently Private Bagshawe's sister and heir came forward and the figures were bought from her (for 25) a year later in 1935, the original registration numbers being retained. According to Towndrow, Bagshawe's father was 'one of Stevens's Sheffield cirlce' (Towndrow 1939, p. xvii).